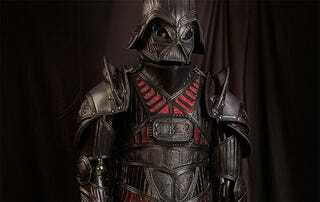 Prince Armory have made this amazing Darth Vader costume, which doesn't just look great but has enough detail to maybe actually work as an actual suit of armour. Though your protection against lightsabers may be limited. The entire suit is articulated, so it can be worn while you run around pretending to choke peasants and elves, and is made from "10oz premium veg tanned leather", which is why it looks so pretty. Before you say anything about how the eyes look kinda stupid, that's actually a nice touch: being inspired my medieval design, it's gone back in time and dug up Vader's original appearance from Star Wars' concept art, not the final design that made it into the movies.